Here we go, I sure hope I don't trip on the way to the podium!! I need to remember to smile and stand up straight! Wait I can sit at home in my jammies and accept the Liebster Award!!! It's an award in blogworld!! I want to start off by thanking Andi over at Delusions of Ingenuity for nominating me!! A sincere thank you Andi I am so flattered and honored! The blogworld to me is like being a radio DJ, you are always wondering, "is anyone listening?" That is why bloggers love comments! It is great to know that someone checked out your post. And even better to have someone nominate you for the Liebster Award!! According to my research...... OK I will give everyone a moment to stop laughing and catch their breath after visualizing me doing some research.....The Liebster Award originated in Germany. It is a pay it forward type award. The Liebster award is for new, upcoming bloggers with less than 200 followers. After being nominated you first thank the blogger who nominated you, again thank you Andi!! Then answer the 11 random questions they ask you. Next you are to share 11 random facts about yourself; 22 bits of random information about me, oh my gosh lets get started!! Then I get to nominate three bloggers with less than 200 followers, ask them 11 questions, and well that's the pay it forward part! Lastly make sure you link your post back to the blogger that nominated you! So let's get started I am sure everyone will sleep better tonight knowing 22 bits of random info about me!! 1. Do you have a pet preference? If so, what? Dogs dogs dogs! I have to say I am a bit worried about myself. I have become a "dog park person," I know the names of all the dogs at the park.....but hardly any of the peoples names. I bought our dog Dexter a sheepskin coat this past winter, I have been to the "Puppy Playhouse" and I liked it! I fear I am going down a road of no return! 2. Is there a blog that inspired you to get blogging? Some of my friends suggested I start a crafting blog, I laughed. Then I connected with my childhood friend (Wendy) and she had a crafting blog (CreateCraftChere)......well I had to have one too!!! I love sharing this blogging journey with her. Our friendship truly is forever!! 3. What's your favorite movie(s)? I love all movies and it is so hard to pick a favorite. As a kid I use to have what I called "Tomato Soup Saturdays" when I would make tomato soup (with Ritz crackers) and watch Shirley Temple movies on cable TV. On the other side of the coin (way on the other side) I sat with my mouth opened throughout every minute of Pulp Fiction the first time I saw it. I love love love all the Toy Story movies!! But I guess "The Way We Were" is my fave favorite, love me a good love story and some Robert Redford!!! 4. What's your favorite food? I like, love and appreciate all food equally!! But if there is melted cheese or bacon involved, it's mine!!! 5. Boxers or Briefs? Boxer Briefs!!! The best of both worlds!! Just kidding. But my answer is serious! Favorite (book) author? Geeze the boxer/brief question was easier for me!! I am an avid reader. I always have a book to read. I have a really odd fear of being without a book to read. And even though I have a Kindle HD Fire : ) I am an old school girl that still reads actual books. 7. What superpower would you choose? Can I invent the "cure cancer superpower??" 8. If you could do anything (career), what would it be? Fortunately I have had an absolutely amazing and successful "career" that has brought me joy everyday. I have two amazing sons that fulfill me each day like nothing else could. Of course now that one son is out on his own and the other son ready to go in the blink of an eye, I wonder, does Guy Fieri need a co-host for Diners, Drive-Ins and Dives? I am perfect for the job! 9. Where do you dream of traveling to? To Diners, Drive-Ins and Dives preferably near warm sunny beaches. 10. Spring, Summer, Fall, or Winter? Summer, because gardening is in my soul. 1. I was once on stage with Bill Cosby. I am not going to explain this, but here are some details, It was at Harrah's Lake Tahoe, on a date with a musician and that's all you need to know! 2. I have made many "creative choices" with my appearance, fortunately none that were permanent. 3. I started kayaking late in life, so I need to make up for lost time! 4. I love that I can sit on my couch and look out the window and see Mt. Rose and know that Lake Tahoe is right on the other side! 5. My husband is also my best friend! 6. I can't stop thinking of things I want to make. People ask me "what inspires you" I always answer the same "what doesn't inspire me?" 7. I really enjoy following Andi's blog about the building of her new home. 8. Both of my boys started talking really early, and none of my friends or family were surprised???? Like I had set some kind of example for them I guess!! 9. I am going to design and sew a wedding dress, just because I want to! Yes I will be blogging that creative venture! 10. I blog late at night. And I know I am not alone. 11. I love connecting with other crafty creative people in the blogworld! And the real world too!!! 1. Wendy over at "CreateCraftChere" Of all of Wendy's many talents, I am the most jealous of her crocheting skills. I often "suggest" things for her to make! She loves that about me. Wendy inspired me to blog, we are the kind of girlfriends that share everything!! You must check out all of her crafty skills at her creative blog! 2. Bec over at "Two Worlds" is my next nominee. I love connecting with bloggers from all over the world. Bec is based on the Sunshine Coast Queensland Australia. I feel like I am on vacation when I visit her blog. Definitely check it out! 3. Elisha over at Pneumatic Addict Furniture: is #3. OMGosh I love every single project she has on her blog!! This lady is setting the trends, not following them! I am pretty sure Martha Stewart must be getting ideas from Elisha's blog!! If not well she should be!! If you like cool, well made, on trend, unique, did I say cool? projects, click on the link above and visit her blog! Please visit all three of my nominees and leave them a comment. Don't forget to sign up and follow them on their blogging adventures too. Make some time to visit Andi, who nominated me, over at Delusions of Ingenuity Andi along with her husband, are currently building a new home. Talk about the ultimate DIY project! I love following long term projects. She has a great writing style and and even better attitude. My favorite blog to follow....and that is random fact #12! Here are my 11 random questions for my nominees. 3. What kind of camera do you use? 4. 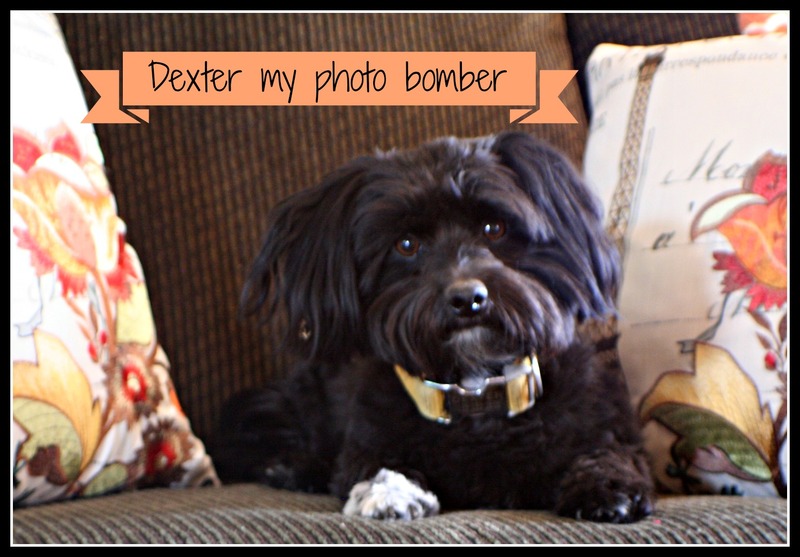 Do you have a favorite photo editing program? 5. What draws you to check out a blog? The photos? The writing content? Crafting style? 6. What book, magazine and/or newspaper are you currently reading? 9. What was the last movie you watched....that you liked!!? 10. If I made dinner for you, what would you like me to make? 11. In the future would you do a guest post on my blog? Congratulations to all my Liebster Award nominees!! Make sure to follow up at their blogs and see their answers to my questions. 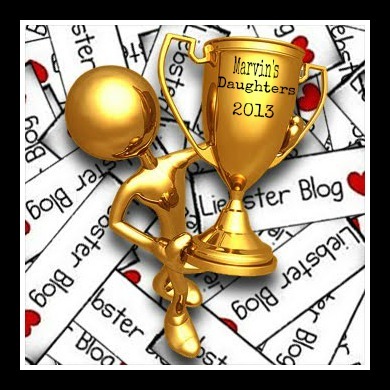 I will proudly honor the Liebster Award forever here at Marvin's Daughter's. I am humbled. For those first time visitors PLEASE check my other posts, I usually add some crafts to my chatter!! Awesome!!! I love what you did with your Liebster! So much fun, no? I also recently discovered Pneumantic Addict...LOVE her! I'll have to check out your other 2 picks. And I totally agree with you on the book/kindle thing. I have a kindle fire also, but I love the feel of a real book in my hand! Stephen King and Diana Gabaldon are my all-time faves, just in case you were wondering. :P Great post!! hi Lori, today on my post I have mentioned you and provided a link to your lovely blog in regards to your nomination for a liebster award.